The winner of the most recent Caption This Contest wassssssss... Jeni!!!! I've known Jeni for over three years online and on phone. 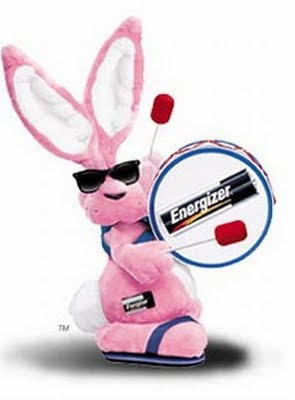 I think she might like this Energizer Bunny. I hope he comes with cell phone batteries! Way to go Jeni! I LOVE the energizer bunny... just be careful though, I've heard that he and a certain guinea pig hang out together and corrupt each other. Just sayin. Thanks for the heads up warning, Misty. And here I was going to ask Barb for an extra set of energizer bunnies cause I do think I really need more than one. Glad you got the stairs Barb and can now try to keep Hannah!